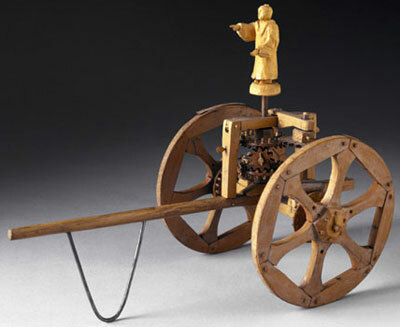 The South Pointing Chariot was an ancient Chinese mechanical-geared wheeled vehicle, used to discern the southern cardinal direction. There are quite a few of legends about inventing of the South Pointing Chariot. 1. The Yellow Emperor (Huang Di or Ti) invented the South Pointing Chariot about 2634 B.C. in order to guide his troops out of enemy's smoke screen, and finally defeated his enemies. 2. The South Pointing Chariot was constructed around 1030 B.C. by (order of) the Duke Wen of Zhou, who gave five such devices (called Chih-Nan) to ambassadors of Yüeh-Shang to get them back home. The oldest survived to our time written description of a south-pointing chariot is that of Fu Xuan (217–278), a politician, scholar and writer, during the period from the Cao Wei to Western Jin Dynasty. In most pictures the South Pointing Chariot was depicted as a horse drawn cart on which stands a figure whose one arm points south and continues to do so, no matter which way the cart is drawn. The chariot could travel in curves, loops, or any convoluted path, even backward, but that statue stubbornly continued pointing south (of course, if the ground surface was flat and the wheels didn't slip. 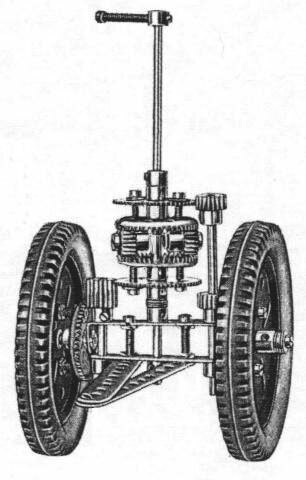 It is believed that most, if not all, South Pointing Chariots worked by means of differential gears (see the nearby image of Meccano model, Lanchester design, from January 1957 issue of Meccano Magazine). The differential motion of the wheels drove the gears, which in turn causes the statue to rotate the same angle as the carriage turns, but in the opposite direction. A differential is an assembly of gears, nowadays used in almost all automobiles and other vehicles, which has three shafts linking it to the external world. The gears cause the rotation speed of the first shaft to be proportional to the sum of the rotation speeds of two others. There are no other limitations on the rotation speeds of the shafts. The differential mechanism of the chariot had four wooden gears, arranged in much the same way as the differential gear of an automobile. Additional, conventional, gearing was required to connect the differential to the wheels. The wheels drove the gears, which in turn rotated the statue. The legend even tells of a similar south-pointing ship, but this goes beyond credibility, as the differential mechanism requires a flat, level and unmoving surface to work properly. That was more likely a magnetic compass, which was known in China from 3rd century B.C.